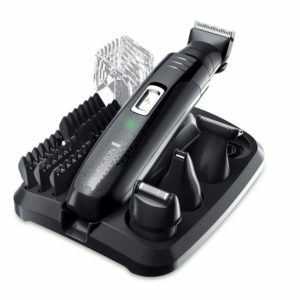 Having been in the men’s grooming business for about 75 years, Remington knows to come up with products that help men to style their facial and body hair with confidence. The Remington PG6130 multi-grooming kit is proof to this fact. It comes with high-quality and professional features which you can use to transform your hair style within minutes. This kit is for those men who want to look their best always and who exude oodles of confidence with their new styles. We will go over the features, pros, and cons of this grooming kit. Read through our grooming, beard, and stubble kit review to know if it worth your money or not. From the above, it is clear that the Remington PG6130 does come with a lot of benefits and a few demerits. It can be concluded that this kit is great if you are going to use it for your everyday shaving and trimming. However, if you are expecting your grooming kit to help you achieve perfect lines, beard trimming and removing unwanted hair around your ears, you might have to look at other alternative options. In short, the PG6130 Remington is affordable and gives you good value for your money if you use it for your daily shaving to keep your beard and stubble in line while also taking care of any other body hair you need trimmed. It is sitting at 3.8 out of 5 stars with 67% at 4 stars or above. This ranks this grooming kit a bit lower than some others out there. The price point is good for the kit if you are looking to get the job down, but you may want to read a the review on the on of the other kit’s we have reviewed like BaByliss for Men 7420U Super Groomer Review, to help you decide if it is right for you. Well were to start use time rubbish dose not hold a charge it has no power it slows as soon as you add the clipper head it performs so bad i had to know why so i oppened it remington should be ashamed to put there name to what i found the clipper only works on the charged battery inside is a 1.2v 730mah AAA this is very under powered for the job and not fit for purpose to give you an idea of the power output of this AAA its the same battery you get in cheap pound shop solar power light even they have two AAA’s un like this clipper that has just the one mine lasted three months of light use im not impressed and feel that i have been ripped off DO NOT BUY THIS PRODUCT !